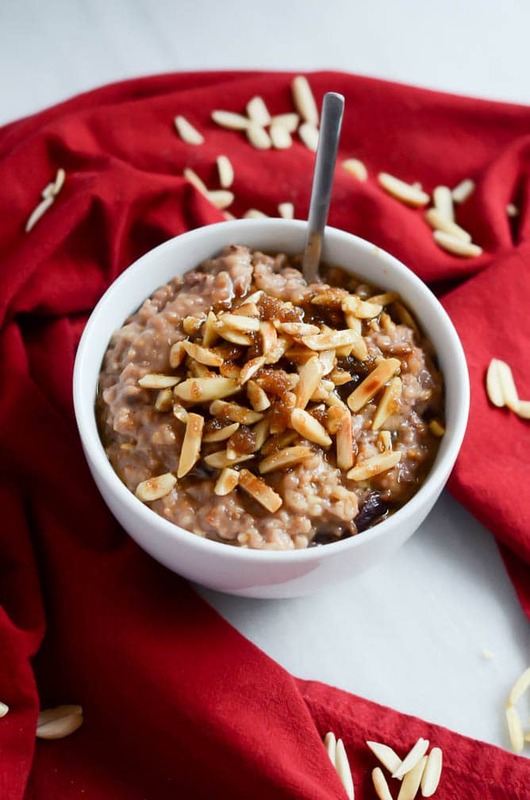 This warming oatmeal is full of comforting chai spices and filling chia seeds. 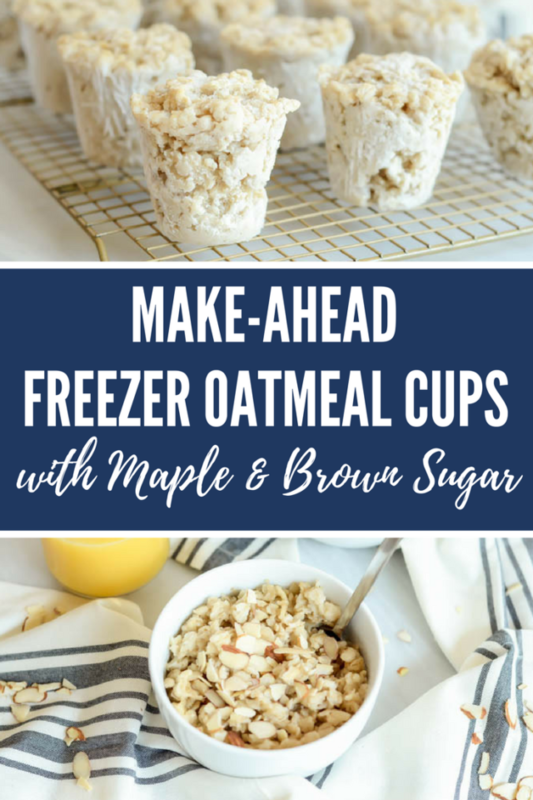 It’s the perfect, healthy cold weather breakfast that will keep you right on track with your healthy eating goals. It’s time to hop back in the saddle of life, and I’m going to do it with this Chai Chia Oatmeal by my side. We got back from Lake Tahoe late Thursday night, just one day after we had initially anticipated and one day before the next storm was supposed to come in. We had such a great time relaxing, playing games and spending time with family…We never wanted to leave but, alas, we had to get back to reality and do this thing called life. After two weeks away from home (and mostly eating other peoples’ food) I was so excited to get back in the kitchen on Friday and make my own delicious, wholesome food. 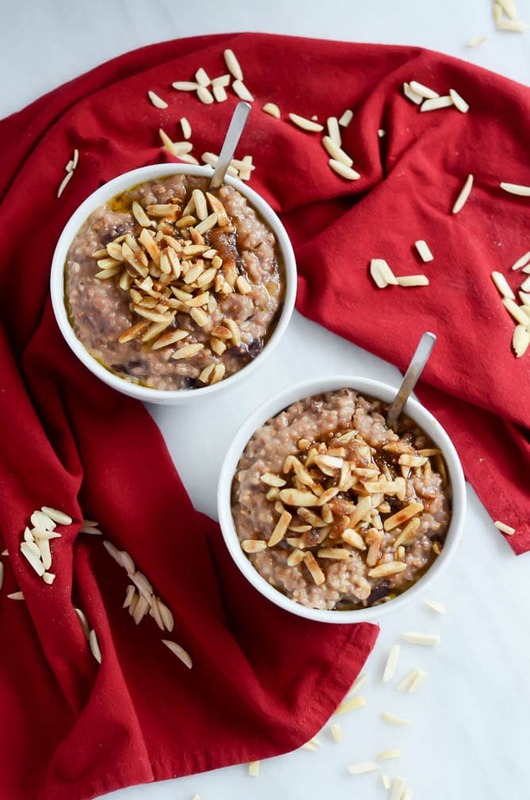 First up on the list was this Chai Chia Oatmeal, which IMHO is the perfect January breakfast. Healthy, filling and easy to prepare, while still making us feel that we don’t have to say goodbye to all of the festive holiday cheer that has filled us up over the past couple of months. Speaking of cheer and happiness, has everyone set their intentions and goals for the New Year? I prefer to do this instead of setting resolutions, as having an end goal always motivates me to push forward and achieve everything I want to do. I took some time in between Christmas and New Year’s to reevaluate the direction I want to take the blog (and related business,) and I’m so excited to start setting things into motion to achieve these goals. The New Year is a perfect time for this, but I think it’s important for us to remember to stop, reflect and reassess more often than once every 365 days. One of my goals for 2017 is to check in with myself AT LEAST every month, and see if I need to approach things a little differently or start focusing more of my time on something else. I think this is so necessary for entrepreneurs like myself, but also for anyone who is trying to achieve something in the New Year. Tell me, what are your goals and intentions for the year ahead? We all know that one of the biggest intentions people set at New Year’s is to clean up their eating habits. Although you all know I don’t believe in restrictive diets, I think it is inevitable that eating healthier, more whole foods is top of mind at this time of year. 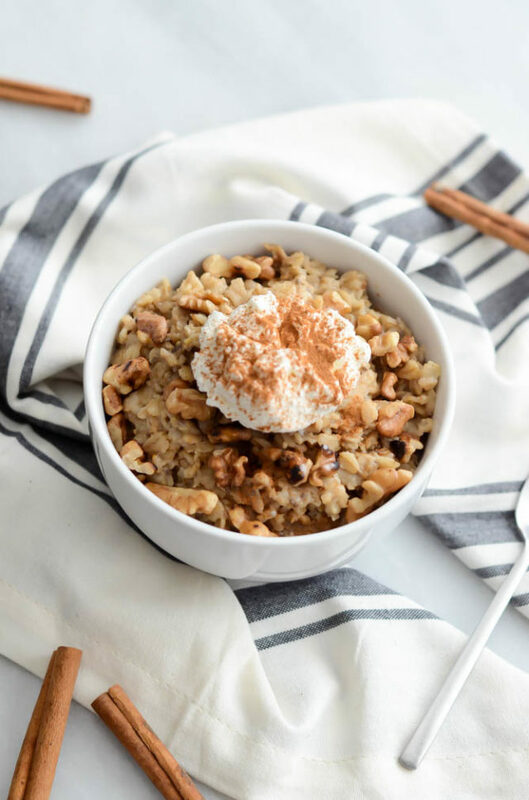 I’m all for the healthy eating (and this Chai Chia Oatmeal is healthier than I’ll get out) but let’s not forget to sneak in little indulgences here and there. If it were up to me, I’d ask each and every one of you to have the goal of more BALANCE in your life as opposed to setting restrictions for yourself. 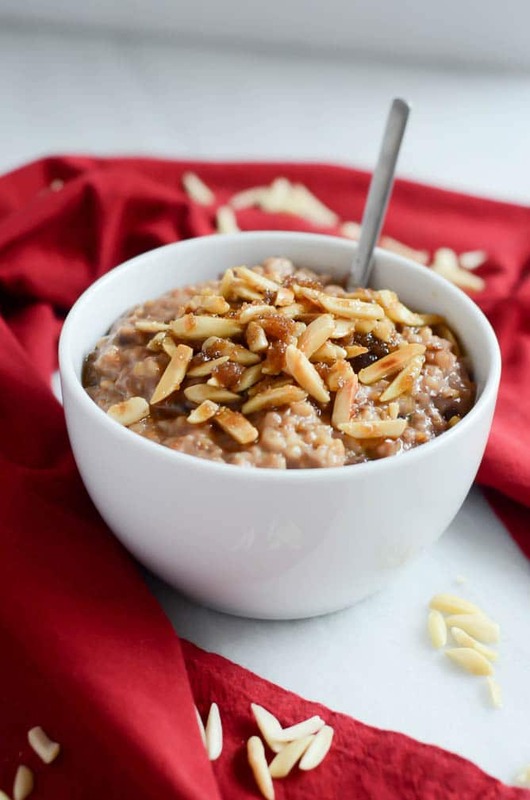 So time for me to get off my pedestal and tell you all about this Chai Chia Oatmeal that is likely to be on repeat weekly in your household once you try it. It comes together in under 30 minutes, and even reheats well if you want to prep it in advance. There is also a huge amount of flavor for very few ingredients. All wins in my book! 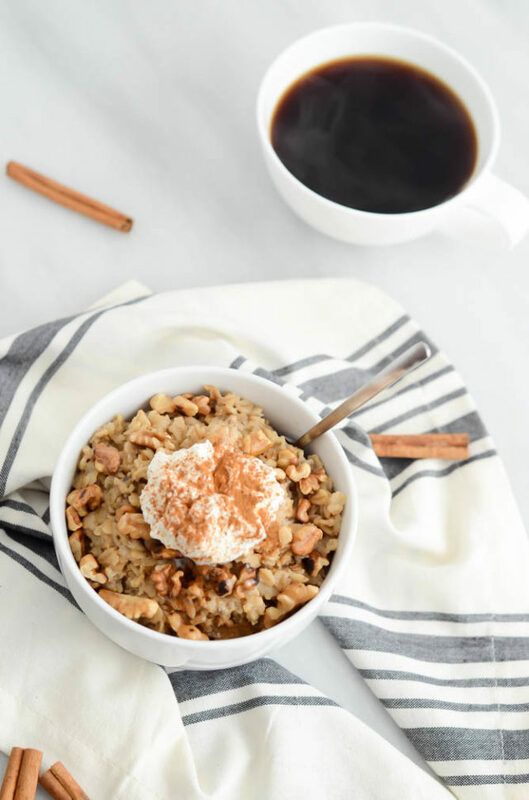 Perhaps my favorite part of this recipe is the way we get the “chai spice” flavor into the oatmeal. Rather than having to worry about throwing in all of the different spices that go into chai, we simply steep two chai tea bags in the oatmeal’s liquid as it cooks. I used half water and half unsweetened vanilla almond milk, but you could easily go all one or the other based on your taste preferences. 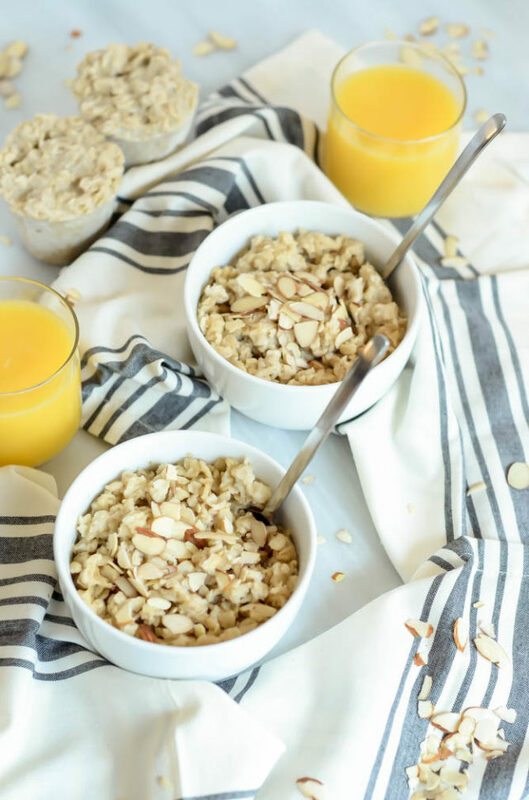 Aside from the above mentioned base ingredients, all that goes into this wholesome breakfast is honey, a little vanilla extract and, of course, the chia seeds! 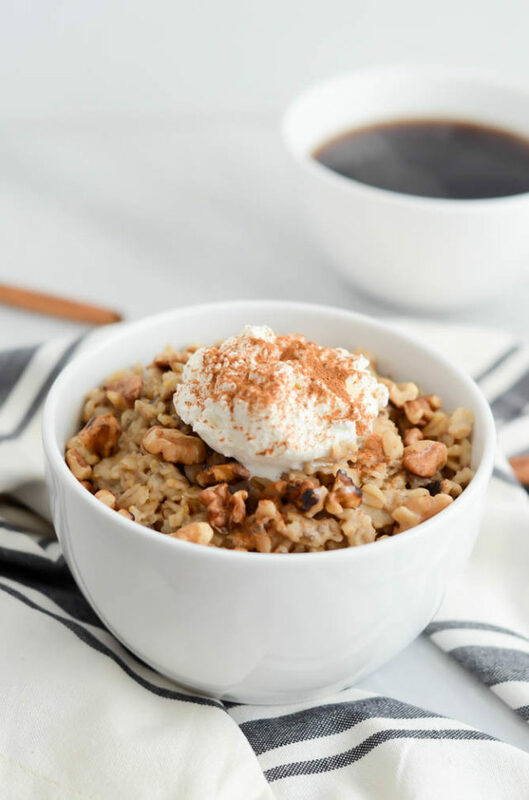 And if you really want to jazz up your Chai Chia Oatmeal, may I suggest topping it all with toasted walnuts, homemade whipped cream and ground cinnamon? Or what about pecans, maple syrup and Greek yogurt? The healthy possibilities are endless, my friends, so let’s get about whipping this up in the kitchen, shall we? 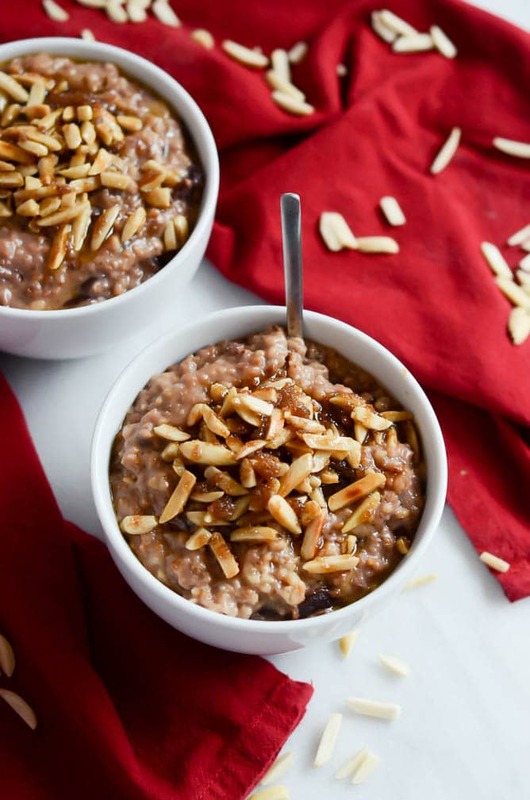 This warming oatmeal is full of comforting chai spices and filling chia seeds. It's the perfect, healthy cold weather breakfast that will keep you right on track with your healthy eating goals. In a medium saucepan, combine the water, almond milk, oats, salt and tea bags. Bring mixture to a boil and cook for about 10 minutes, or until all of the liquid has absorbed into the oats. Stir in the honey, chia seeds and vanilla extract. Spoon into bowls and top with desired toppings. Serve immediately. Because I wanted to get a jump on my first day “back in the office” (ahem, my kitchen/couch) I decided to throw the ingredients for this Slow Cooker Cherry Pie Oatmeal together in my Crockpot last night. Nothing like having a healthy, delicious, incredibly November-y breakfast ready to devour as soon as I wake up! Enter: Slow Cooker Cherry Pie Oatmeal (basically the only way I am enjoying oatmeal these days.) I can’t remember EXACTLY how I came up with the idea to basically pile all of the cherry pie flavors/ingredients together with steel cut oats and two types of milk, but I have a sneaky suspicion that it was spurred by my recent use of some leftover frozen cherries I had on hand in the hubs and my morning smoothie. We’re usually very much creatures of habit with our Power Protein Smoothie, but sometimes my desire to use up whatever fruit we have in the freezer leads to some pretty great things. This was one of them. 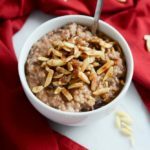 I’m saving our new favorite Cherry-Vanilla Smoothie for another post, so in the meantime I’m hoping to tide you over with Slow Cooker Cherry Pie Oatmeal. And let’s be honest, we’re way more into cozy, warm, tummy-filling breakfasts during these cooler winter months than icy, frozen smoothies, am I right? After coming home from a good amount of time on the road, there’s nothing more comforting to me than a big, warm bowl of oats. 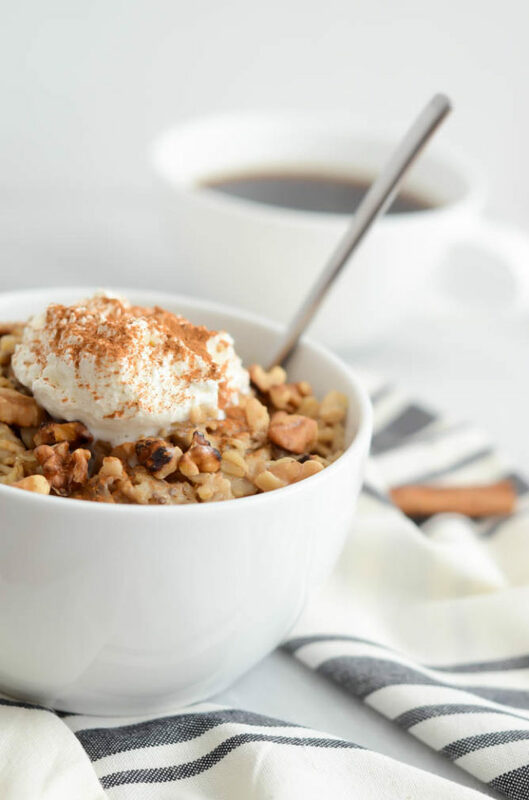 This Slow Cooker Cherry Pie Oatmeal is mostly healthy, with a little dash of extravagance to really put it over the top and keep you running back to the Crockpot for more. 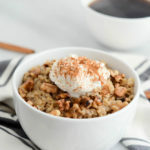 We throw everything into the slow cooker before bed, and in the morning all that’s left to do before digging in is whip up our show stopping almond, brown sugar and butter streusel to sprinkle over the top. I suppose you could even skip this part, but let me just say you’d be doing yourself an honest injustice. Guys, the topping makes this dish. It may not be entirely healthy, but since the rest of the dish is pretty spot-on nutrition-wise, we can certainly make a little exception. You know how I like my balance! 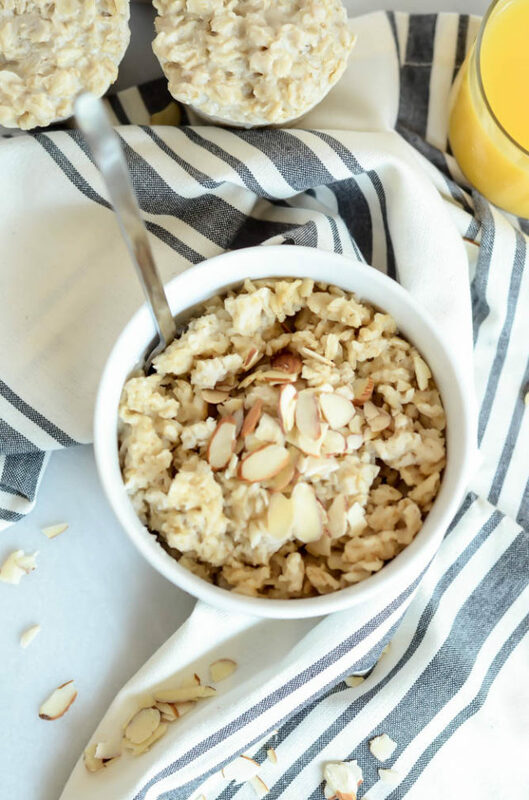 Cherries, lemon zest and almonds come together with steel cut oats to make a delicious slow cooker dish. Set it the night before and enjoy it in the morning! When oatmeal is finished cooking, make topping. Place butter, brown sugar and slivered almonds in a small bowl and mix with fingers until well combined. 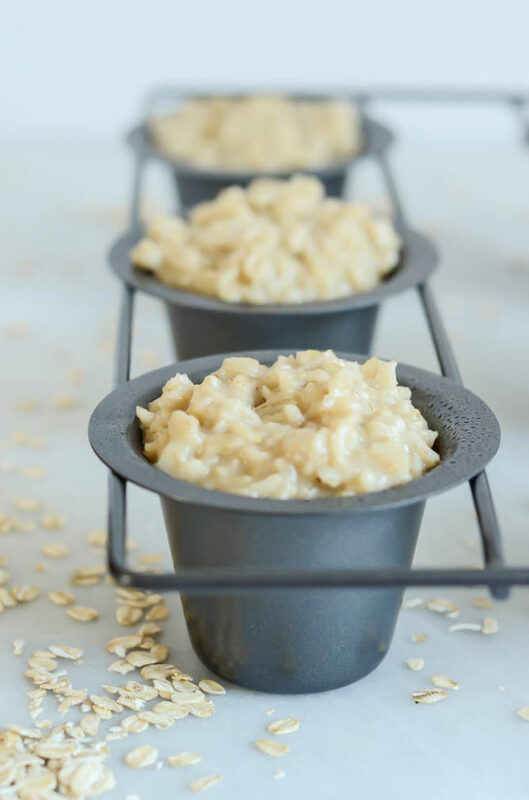 Scoop warm oatmeal into individual bowls and top each bowl with a generous amount of the topping. Serve immediately. Cherry pie in the best possible way! That’s all I needed to make these wonderfully perfect Butterscotch Apple Oatmeal Cookies with Bourbon Glaze at least. You see, I first made these little bites of deliciousness when I was up at my parents’ house last weekend and, even though they disappeared in less than 24 hours, they weren’t exactly what I had been hoping for. They bordered on “breakfast biscuit”…They weren’t overly sweet (save for the butterscotch chips), and all I could think about was wanting to dunk them in some sort of hot beverage. 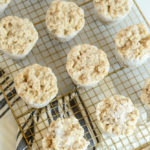 For me, if I want to eat a cookie, I want it in all its glory – sweet, buttery and indulgent – so I decided the recipe needed a few tweaks, a second chance. That’s both the up- and downside of being a food blogger. The upside is that you have the freedom to make and retest a recipe as much as you’d like – there’s no one standing over you with tight deadlines or hungry guests sitting at a dining table. The downside is that you can put soooo much work into a recipe, with the highest hopes for its success, only to have it completely fail on you. Lucky for you, I’m here to do all the testing, so that you don’t need to worry about the recipes that you try from this blog falling flat on you (and if it does, I really hope you’ll tell me so I can fix it!) That’s one of the main purposes of CaliGirl Cooking, after all, to make EVERYONE feel confident in the kitchen, no matter your culinary history or skill set. Speaking of recipe testing, I’ve certainly been doing my fair share of it over the past week or so. If you follow me on Instagram or Facebook, you’ll have seen that tomorrow I’m hosting a Feed Supper at one of our local hotels. I’m extremely excited and honored to have this opportunity, but I’d be lying if I said I wasn’t nervous! This situation is quite different from my usual day-to-day recipe production (only cooking for myself and my husband and maybe a couple of friends) and let’s just say I’ve been feeling the heat. There’s a lot more pressure when cooking in a public place, for people you don’t necessarily know, than when I’m just tinkering around at home and have room for a tiny adjustment or two. BUT, I’m happy to say that all of the recipes I tested were great successes, and as long as I can get everything prepped and ready before they shut off our power for routine maintenance tomorrow, I’ll be good to go and ready to party for a great cause. Alas, I digress. 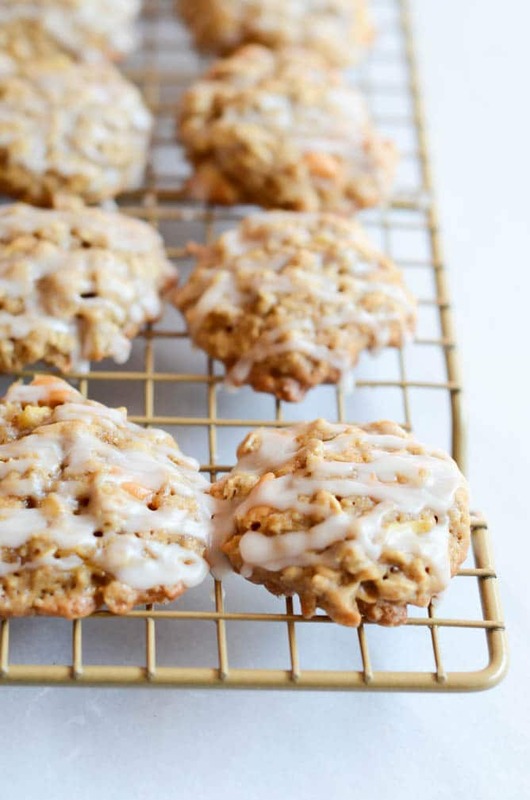 Let’s talk about these Butterscotch Apple Oatmeal Cookies with Bourbon Glaze because they definitely deserve their fair amount of attention. So here’s how I decided to spruce things up the next time around: As I mentioned, the original cookies were cakelike and not too sweet. I wanted them sweeter and more moist, decadent was the word I was looking for. For the second batch, I added another egg and upped the amount of brown sugar, and this did the trick! But I still wanted something more, because I’m a food blogger and just can’t leave things be. Enter: bourbon glaze! I threw some powdered sugar, vanilla almond milk and bourbon into my stand mixer, and quickly whipped up the perfectly consistent drizzle. If you want to keep these cookies “kid-friendly” you can just double the amount of almond milk and omit the bourbon, no biggie! But if you’re just feeding “big kids” (over 21 that is) I highly recommend you leave the bourbon in. I used a piping bag with just the tip cut off to generously drizzle the glaze over the already-delicious cookies and, voila! 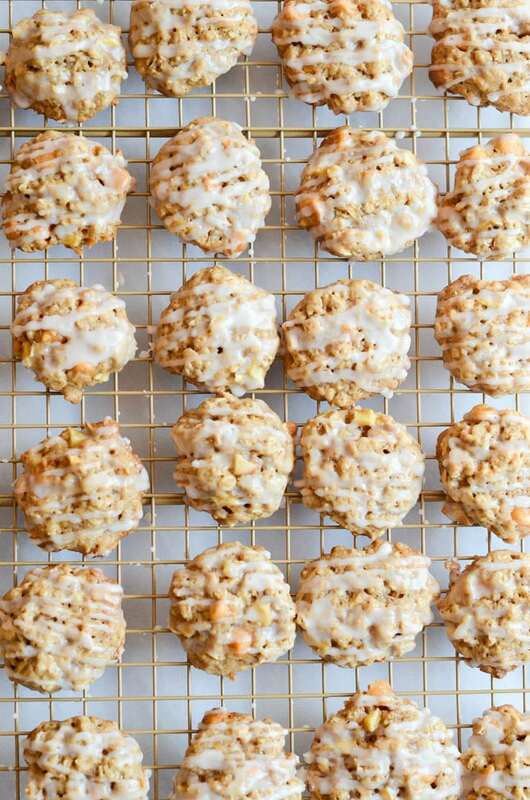 Butterscotch Apple Oatmeal Cookies with Bourbon Glaze were born, tastier than ever. 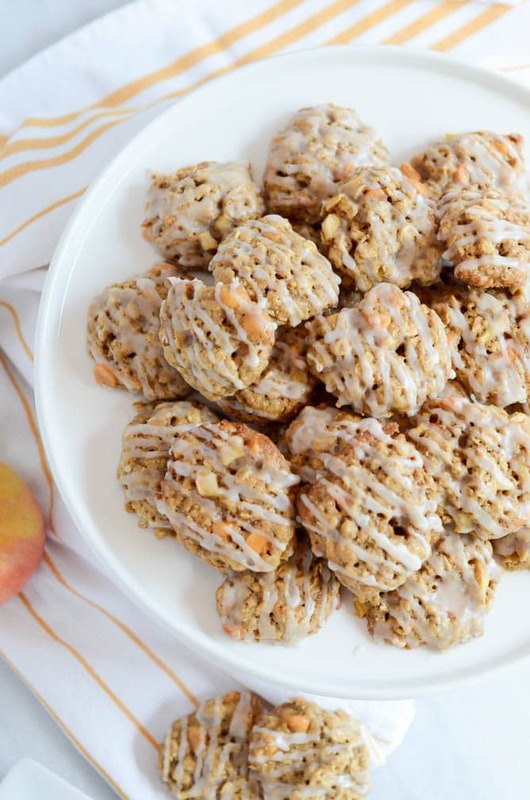 These cookies are literally the taste of fall in one bite. 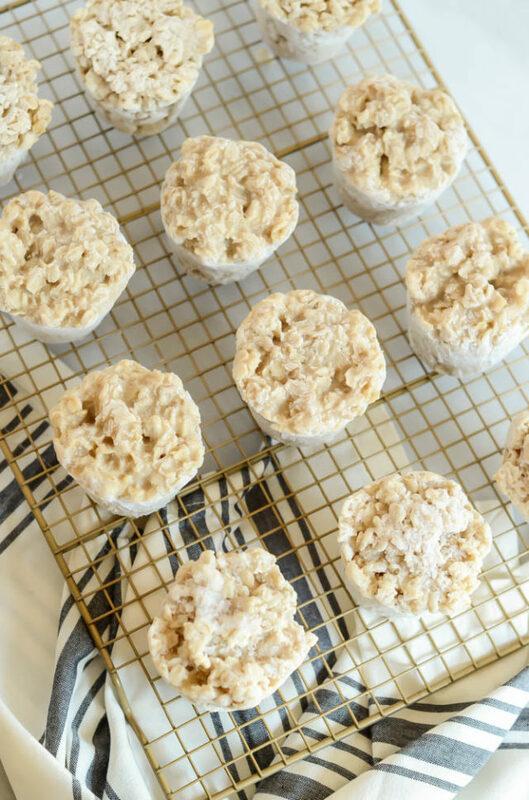 The sweetness of the butterscotch and apples is balanced perfectly by the heartiness of the rolled oats, while the bourbon glaze adds the perfect kick. 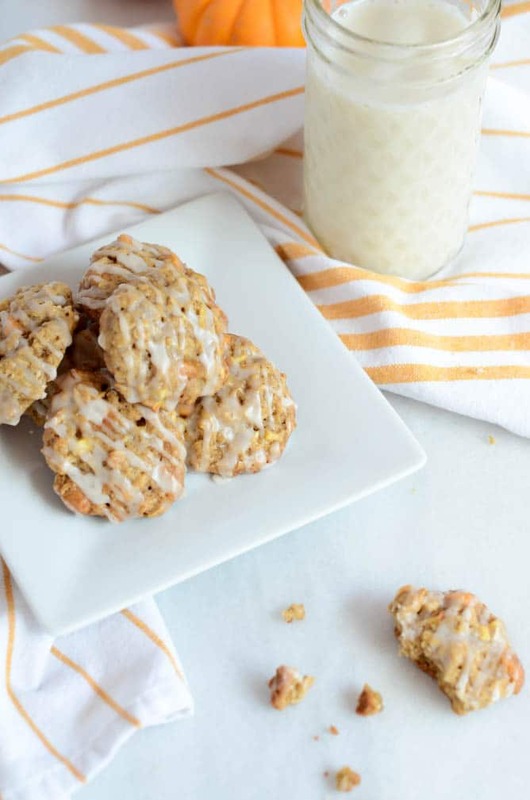 We’re still experiencing 70-80 degree weather here in Santa Barbara, but right now all I want to do is make a batch of Butterscotch Apple Oatmeal Cookies with Bourbon Glaze and a warm mug of coffee and head to my nearest pumpkin patch. Who’s with me? 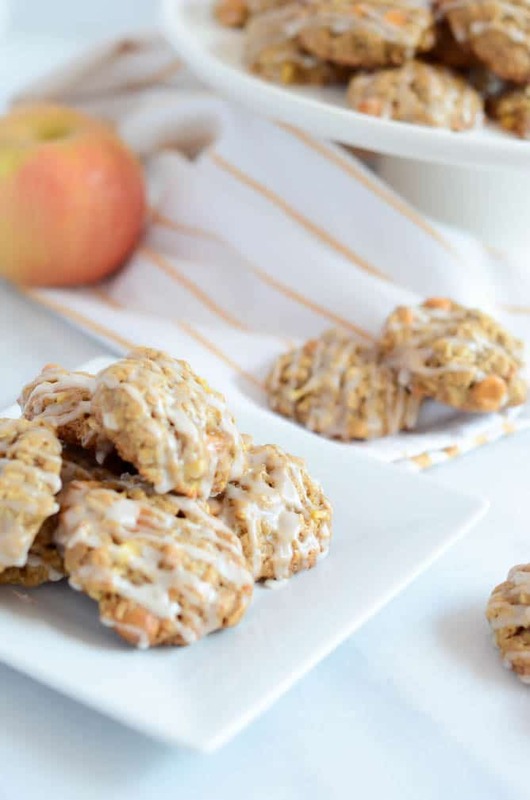 In these bite-size cookies, oatmeal is laced with chunks of fresh apple and butterscotch chips and topped with a sweet bourbon glaze. Place butter in a small saucepan over medium heat. Let sit on heat until butter has melted and browned slightly, releasing a nutty aroma. Transfer to a heat and freezer safe container and let cool slightly, then place in freezer for 30-45 minutes. Remove butter from freezer and let soften ever so slightly (you just want it to be able to mix well with the sugar.) I microwaved it for about 30 seconds to help it soften up. In a medium mixing bowl, combine flour, oats, baking powder, baking soda, cinnamon and salt. Set aside. In the bowl of a stand mixer, combine brown butter and brown sugar. Mix at medium speed until the two ingredients are well incorporated, then mix in the eggs and vanilla. Add the dry ingredient mixture and beat until just combined. Remove bowl from stand and stir in apples and butterscotch chips using a wooden spoon or spatula. Using a small cookie scoop (or a tablespoon measure,) scoop dough onto prepared cookie sheets, leaving only about an inch and a half of space in between each scoop. Flatten dough slightly with hands before baking. Bake in 350 degree oven for 10-12 minutes, or until cookies are a light golden brown. Remove from oven and let cool on cookie sheet about 5 minutes, then transfer to a cooling rack. While cookies are cooling, make the bourbon glaze. 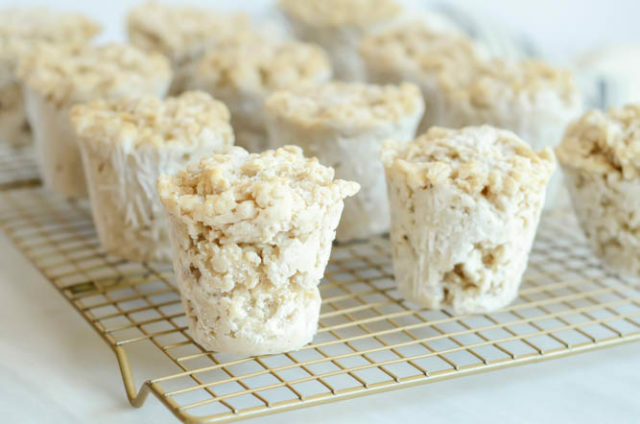 Combine powdered sugar, almond milk (or regular milk) and bourbon (or more milk if making this recipe for kids) and mix using a stand mixer, hand mixer or whisk until a glaze has formed. Scoop glaze into a piping back or gallon-size resealable plastic bag. Cut off the tip of the bag and drizzle glaze generously over the cookies. Let dry about 15 minutes before serving. These cookies can be stored in an airtight container for up to a week. 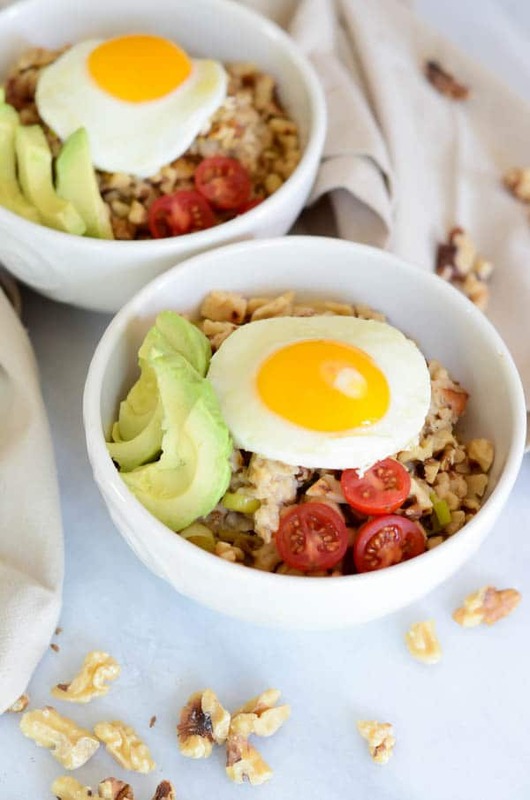 I know it hasn’t been long since I shared this Slow Cooker Superfood Oatmeal with you, but I just had to shout this Savory Bacon Oatmeal recipe from the rooftops because, guys, it is THAT good. I have to admit, it took me a little while to hop on the savory oatmeal train, but I am sooo glad I did. This turned out to be the perfect example to show that, even if you might be unsure about a recipe, you should always, always, always give it a shot, even if it intrigues you just a little bit. You never know when it will come out as amazing as this dish and turn you into a new person i.e. 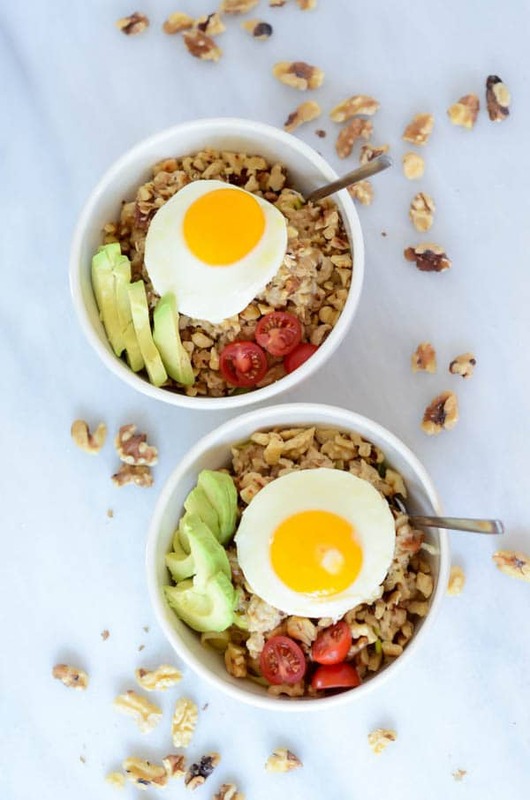 a Savory Bacon Oatmeal lover! 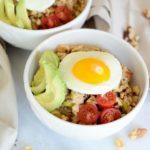 Because I was so unsure about embarking on a savory oatmeal journey, I spent a lot of time dreaming up this particular recipe. 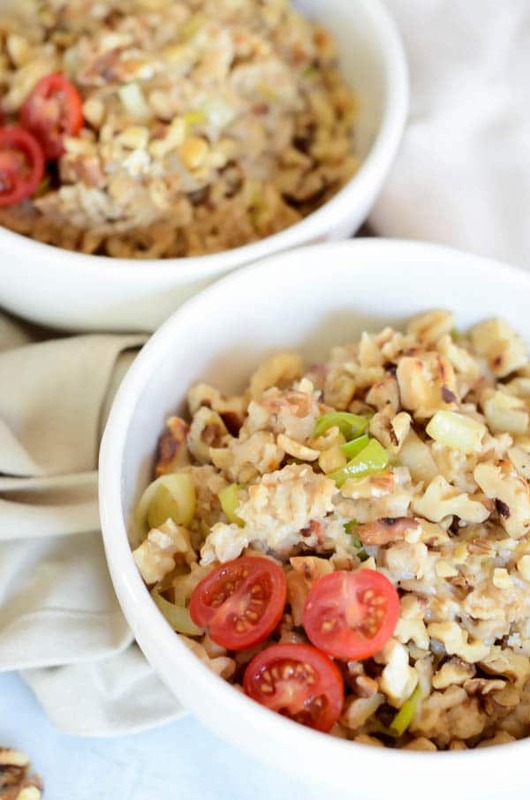 I kept thinking to myself, “What flavors and textures will truly knock this out of the park and make it something I will definitely want to eat again?” Answers: (a) Bacon (b) Miso (c) Sautéed leeks (d) Toasted walnuts or (e) All of the above. I went the obvious route. Side note, but partially related topic: How does everyone feel about the new “every meal served in a bowl” trend? I personally love it! Out of the two camps of (a) being the type of person who mixes everything together on your plate as soon as you dish it up and (b) being the type of person who eats one ingredient at a time and doesn’t like the “mixing,” I definitely fall into the former camp. I think this is why I love bowl meals so much. Who’s with me? So here’s what goes into this bad boy: We start with our good ol’ rolled oats and cook ‘em up. Once cooked, we stir in our trusty miso paste. Not a ton, but enough to get that nice umami flavor in there. I think this is the KEY to this recipe. Seriously, it makes it so good. We cook up some bacon separately and chop it into little bite-size pieces (bits if you will.) We also sauté some leeks, let them reach that slight golden-brown color, then add them to the mix. 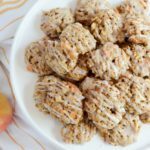 For a little bit of crunch and texture (anyone else think oatmeal’s a bit too slimy without some added crunch?) we sprinkle on some toasted walnuts. We garnish with fresh avocado and sliced cherry tomatoes and then…wait for it…. 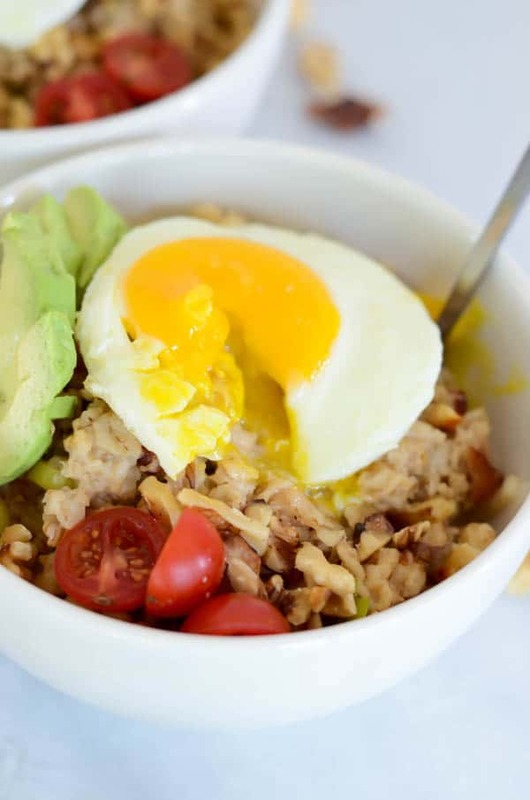 On top goes a beautiful, oozy over-easy egg for us to cut into to let that yolk just drip all over the rest of our Savory Bacon Oatmeal. Have I convinced you yet? What if I tell you this dish would pair perfectly with any of the following breakfast/brunch-themed cocktails? Harvey Wallbanger Mimosa, Lychee Lightning, Peachy Tangerine Kombucha Mimosa, or The Seelbach? Yea, I thought that might win you over. Because this recipe was all about me trying new things, I want to hear from you: What was a “trend” or cooking idea you weren’t too sure about but acted on anyway? How did it turn out? Was it better or worse than you expected? Most importantly, what should I try next?? The classic breakfast turned savory with the addition of bacon, sauteed leeks, avocado and so much more. Combine water, salt and rolled oats in a large sauce pan over high heat. Bring to a boil. Once boiling, turn down the heat enough so you don’t have a boil-over and let simmer for about 20 minutes, or until oatmeal is cooked. Once oatmeal has finished cooking, stir in miso. Leave oatmeal in the pan on the burner but turn the heat down as low as possible. While oatmeal is cooking, prepare bacon. Place bacon slices in a medium nonstick sauté pan over medium heat. Cook until fairly crisp, flipping once. Remove from pan and set on a small plate lined with a paper towel. Reserve bacon grease in pan. Using the pan you cooked the bacon in that still has the grease in it, sauté your leeks. Continue cooking the leeks, stirring occasionally, until they are tender and have taken on a slight golden hue. Add sautéed leeks to oatmeal, stir to combine. Chop up bacon into small pieces, and add that to the oatmeal as well, stirring in until combined. Now, cook your egg. This is where you can be flexible. I recommend preparing the eggs in whichever style is your favorite! Of course, the over-easy egg is great because of the runny yolk, but if that’s not your thing, feel free to scramble or fry. 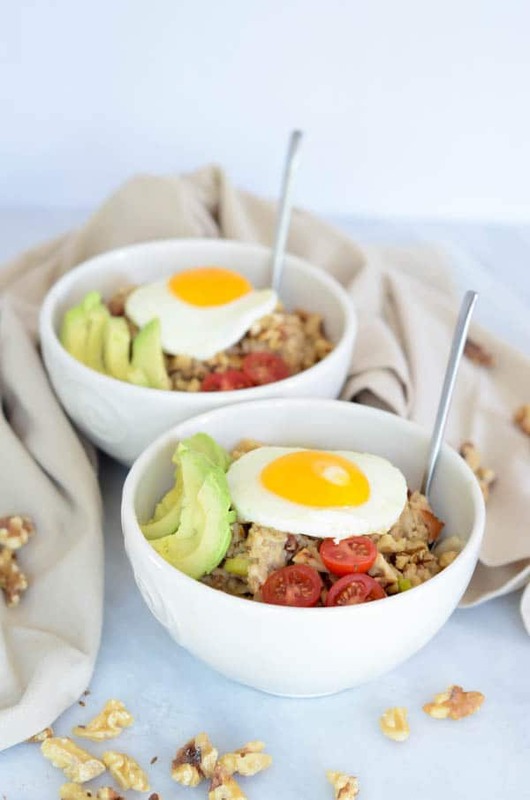 Spoon oatmeal into individual serving bowls, then top with walnuts, avocado and tomato. Lastly, add the egg. Serve immediately.